Young Playwrights for Change Competition! – Why We’re So Excited to Get to Host Again! – Thinking about hosting a Young Playwrights for Change Competition for the first time? – Thinking about joining us again for round two of Young Playwrights for Change? Omaha Theater Company at The Rose Theater hosted a regional competition last year and is pretty excited to get to do again! Here are some reasons why hosting a Young Playwrights for Change competition can be an awesome thing for your community, plus some nuggets of knowledge from our own experience. In terms of planning for the competition, one of the first things that we did was discuss when we would begin going out into the schools to offer playwriting workshops. We wanted to offer workshops early enough in the fall and winter that students would have time to write and re-write before the deadline in January. Since the deadline to enter the national competition was, and still is, February 1st, we made our regional deadline for submission January 15th. We wanted to have time to read the plays and give feedback, while also possibly allowing the regional winner enough time to do re-writes. Finally, we spent a good deal of time discussing what the incentives for entering the competition would be. We wanted to provide incentives for both students and teachers to participate. Personally, for the Omaha Theater Company at The Rose Theater, one of our biggest victories was the number of students who were exposed to playwriting. We did playwriting workshops at all of the after-school programs that we serve, reaching over 360 students in over 30 different playwriting workshops. All of these students were not only exposed to the art of playwriting, but were offered the opportunity to enter the Young Playwrights Competition. Hopefully this helped them to see playwriting as a tool for a social change and a way to tell their stories and make their voices heard. We were also excited that these playwriting workshops were a safe place to have open dialogue about bullying, how it impacts students, and what they want to do about it. I also believe that the experience was important for our regional winners. First, these students now have a scholarship to our Young Playwrights class and are excited to continue writing. Second, the sense of pride and excitement they expressed about their plays was so inspiring. One student brought her whole family of six to see her staged reading. Our regional winner expressed how surprised she was by how much more powerful her play felt in a full-fledged production and how much she wanted to be able to see her words in action again. If just one young person has embraced that her art, her play, her words have power and is excited to continue to engage the world in this way, this whole project was worth it to me. Of course, hosting this competition does not come without its challenges. How do you plan for this? How do you engage students and teachers in this project? How do you empower students to use playwriting as a tool for social change (easier said than done)? How do you get students to actually finish and submit their plays? I’ve addressed how we handled some of these challenges above in the planning section. But one of our biggest struggles was in getting students to actual follow through and submit to the competition. We often struggled with time constraints in our after-school programs, having a very limited amount of time to both teach students about playwriting and the give them time to write, share, and re-write. While we did spread the word to many, there were many teachers and students who we were no able to reach. I think had we formed a better strategy to reach out and engage teachers, specifically English and Drama teachers, we may have had more success. So what is the point of talking about challenges if I don’t talk about what we are going to try to do to solve them? When we met with other hosts at the AATE national conference this year, we had a great dialogue about some of these challenges. Many hosts said that they received the bulk of their entries from classes where the teacher made writing the plays and entering them into the competition, a part of their curriculum. This year we are really going to try to engage teachers and make them partners in the project. We already have one wonderful middle school drama teacher who has agreed to do this as a part of his drama program. We hope to recruit a few more teachers. We are also hoping to spread the word in new ways. Instead of just sending emails and fliers out to teachers in schools, I am going to make some phone calls to our after-schools coordinators, as well as school counselors. I am also going to ask that the teachers we partner with to talk to their friends and fellow teachers. Finally, I think by beginning to teach some of our playwriting workshops earlier in the year and giving the students more time to write, both inside and outside of our after-school program, we will give them a better opportunity to actually finish and submit their plays. 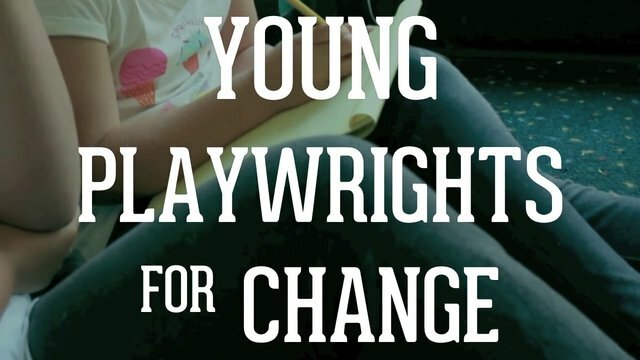 We are so excited to be able to take part in Young Playwrights for Change again! We hope you will join us in this exciting, empowering project! Questions about hosting a competition? Visit http://assitej-usa.org/programs/dramatic-change/ or email me at jackiek@rosetheater.org. Want more ideas for your regional competition? Keep checking back here for more posts and awesome ideas from other regional hosts! Deadline for host sign-up is October 1, 2014! Previous PostYoung Playwrights for Change: Year Two. Don’t Miss Out This Time!